24 members of the Cuban Ladies in White dissident group have finally been freed after their arrest to prevent them from attending Pope Francis’s Mass in Havana on Sunday. The women claim to have been beaten, “dragged by the hair,” and subject to verbal obscenities. 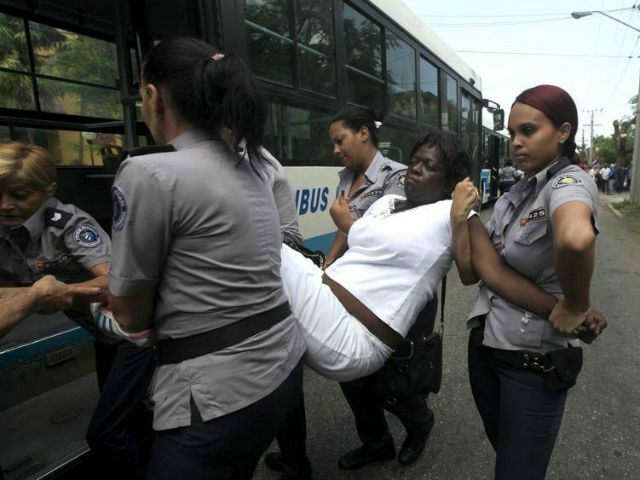 In a video filmed at the home of Ladies in White organization head Berta Soler, Soler and the 23 women arrested with her provide the details of what occurred to them for expressing their wish to attend Pope Francis’s Mass at the Plaza of the Revolution in Havana. 23 of the 24, they explain, were put on a large bus and taken to a secure facility by Cuban secret police. Soler was separated from the group and subject to more abuse. Soler’s story echoes reports of public behavior towards the Ladies in White by communist agents, including shouting vulgarities at the women, men exposing themselves and urinating in front of them, and being insulted as “prostitutes.” The Ladies in White are a collection of women whose husbands, fathers, sons, cousins, and siblings are prisoners of conscience. The other women were kept in another facility, they note, where they were forbidden from eating or using the bathroom. The agents allowed them to watch the Pope’s Mass on television, but “we didn’t want to– we wanted to see it in person.” The ladies say they sat on the floor with their backs to the television for the duration of the Mass. Vatican spokesman Rev. Federico Lombardi said on Monday that a number of dissidents, including a number of Ladies in White, were invited to meet with Vatican officials, though he noted he “did not know” why they did not attend the meeting. Pope Francis himself told reporters that he did not know that any dissidents had been detained during his visit. “I have no news regarding detentions,” he said on his flight to Washington, D.C., and added that he “could not say” whether he would want to meet with Cuban dissidents. At least one dissident, Zaqueo Báez, was arrested in front of the Pope after yelling “freedom!” and receiving a blessing from the Pontiff. While in Cuba, Pope Francis urged Cubans to seek the “revolution of tenderness” and be open to change. What kind of change was never made clear. Cubans seeking freedom and Cuban exiles abroad have expressed disappointment in the visit, in which the Pope neither met with nor mentioned political prisoners and dissidents. Pope Francis has arrived in Washington and delivered his first remarks, in which he lauded America’s freedom of religion, praised American Catholics for being “committed to building a society which is truly tolerant and inclusive,” and called for further action on climate change.